Madrid’s Herbal Remedy Hair & Scalp Conditioner Pommade is a light oil used for itchy or flakey scalp or hair that is dry or brittle. 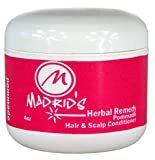 Madrid’s Herbal Remedy Hair & Scalp Conditioner Pommade is a concentrated formula which promotes hair growth and is good for the entire family. Posted September 18th, 2018 in Herbal Remedy. Tagged: conditioner, hair, Health, Herbal, Madrid's, Pommade, Remedy, Scalp.